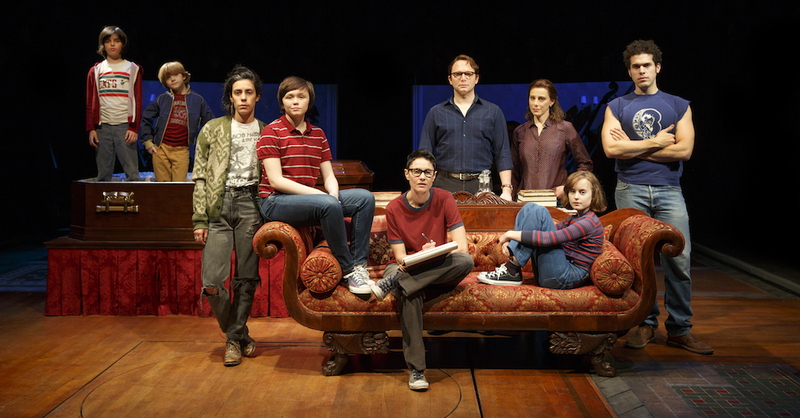 “Fun Home” (photo: Joan Marcus via The Broadway Blog). Home is where the heart is. But sometimes that heart can ache from a life burdened with secrets and lies. That same heart can also beat strong when love, compassion, and empathy flows through its chambers. Fun Home, the new Broadway musical with music by Jeanine Tesori and book and lyrics by Lisa Kron, is full of heart in every capacity — a humorous and occasionally harrowing journey that touches upon our creative yearnings and the emotional baggage we carry and occasionally let go of. 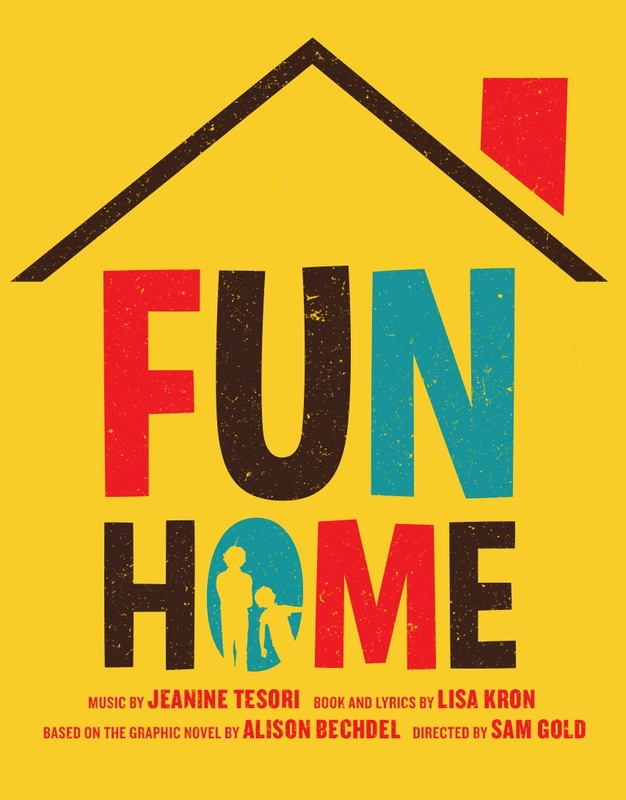 Based on the graphic novel by Alison Bechdel, Fun Home is the autobiographical journey of graphic novelist Alison Bechdel as she grows up in a funeral home helmed by her closeted father, discovers her own sexuality during college, and eventually comes to terms with his suicide. 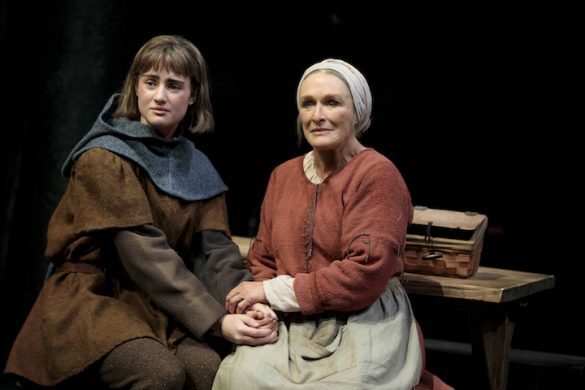 Tesori and Kron’s brilliant construct allows for us to share the journey with Alison through three stages of her life: as a young child (played by Obie winner Sydney Lucas), middle Alison (Emily Skeggs) and adult Alison (Beth Malone). 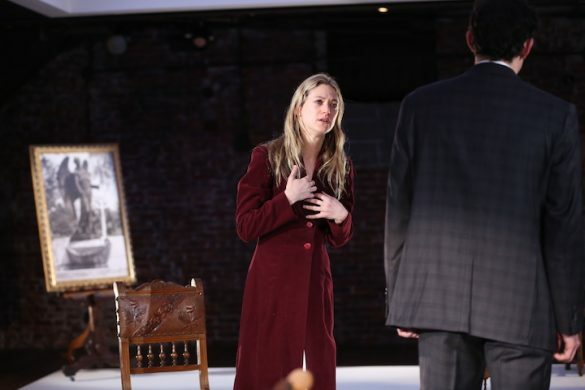 Director Sam Gold seamlessly shepherds the action around David Zinn’s set, which includes a carefully curated collection of “fun home” antiques as well as other specific elements in Alison’s life. 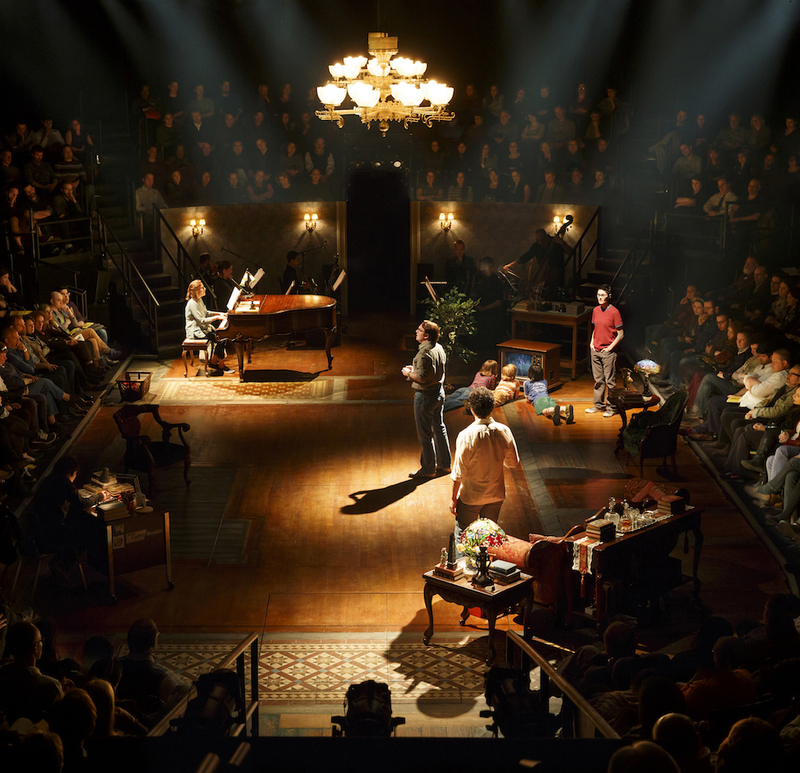 Originally presented at The Public Theatre on a proscenium stage, Fun Home benefits greatly from Circle in the Square’s in-the-round setting, which enables Gold to further immerse older Alison into the action. Tesori’s music is a driving force and carries the same emotional highs and lows as previous works such as Violet and Caroline, or Change. But she’s a chameleon and also imbues the score with 70s riffs that echo The Partridge Family and The Jackson Five. Kron’s book is just as keen, balancing humor with pathos as Alison retraces her life before the audience’s eyes. Alison, in each of her three incarnations, builds a story of hope and forgiveness. As the youngest of the trio, Ms. Lucas is haunting in her natural and untainted demeanor. She is a child discovering her love of drawing and creative expression yet emotionally tethered to her father’s fleeting approval. As the college student, Ms. Skeggs is beautifully gangly and awkward, yet fiery with her newly discovered sexual desires. And providing a calm yet solemn through line, Ms. Malone is not only narrator, but also a mirror of the experiences unfolding before her. 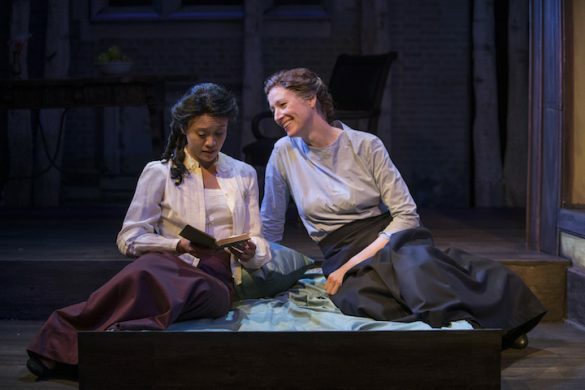 Rounding out the cast are exceptional performances from Judy Kuhn as Alison’s mother, and a Tony-nominated performance by Michael Cerveris, whose tortured inner conflict is riveting and will likely resonate with anyone who has struggled with his or her own sexual identity. Fun Home was a 2014 Pulitzer Prize for Drama finalist and it’s easy to see why. The musical, which so truthfully delves into the specifics of Bechdel’s life, also touches upon universal themes about creativity and truth. As her father falls deep into a life of deception as a means to cover up his repressed homosexuality, he inadvertently smothers her artistic expression in an unconscious attempt to control what cannot be controlled, both within him as well as others. In Julia Cameron’s principles of The Artist’s Way, the author writes that “there is an underlying, in-dwelling creative force infusing all of life—including ourselves.” The fact that real-life Bechdel was able to transcend her father’s creative suffocation is a triumph and testament to the human spirit and a destiny that she felt compelled to follow. Fun Home pays homage to her journey with a captivating theatrical sensibility you won’t want to miss.